Come and enjoy the magic hour of sunset over the sea. 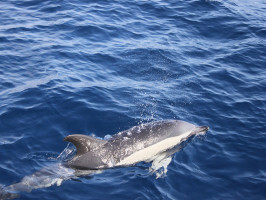 Join us on this exciting excursion aboard the modern and super-fast boat “Biosfera Jet”, as we glide through the blue Atlantic in search of playful dolphins. A must do! 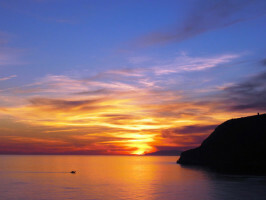 Come and join us for an unforgettable sunset over the sea. 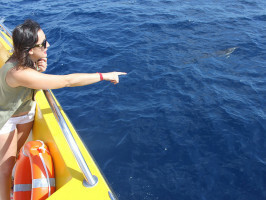 A great chance to see wild and free dolphins. Although sightings are not 100% guaranteed. Meeting/pick-up point in Summer: Pick-up from meeting point in Puerto del Carmen 5:30pm, Puerto Calero 5:20pm, Costa Teguise 4:30pm, Arrecife 5:10 pm and Playa Blanca 4:30pm. 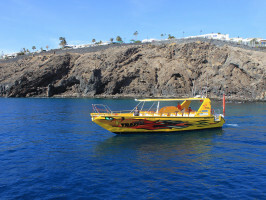 Meeting/pick-up point in Winter: Pick-up from meeting point in Puerto del Carmen 3:30pm, Puerto Calero 3:20pm, Costa Teguise 2:30pm, Arrecife 3:10pm and Playa Blanca 2:30pm. Duration: Approx. 4 hours and 30 Minutes (transfer included). 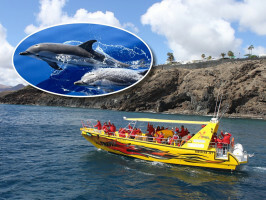 Others: Jet boat capacity 48 passengers. Includes: transfer from hotel, Champagne and pastries. Please bring: warm clothing and sunscreen.